This guide describes the components of electric cables: conductor, insulation, bedding, armouring, outer sheath and markings. It covers voltage rating, current rating, short circuit rating, and earth fault rating. 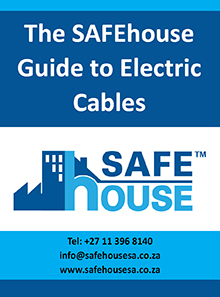 It also lists the compulsory specifications for South African electric cable and gives details of locally manufactured low voltage, medium voltage and high voltage cables. Examples of substandard cables being sold in South Africa are given along with advice on what to look for when buying cable.